Jostling for business venture in the Zimbabwe has reached fever heights as foreign investors descend into the country to have a feel if it is good for business in Zimbabwe. Former ZBC presenter Eric Knight said the scramble for Zimbabwe has begun. Western and Eastern nations are locked in a frenetic race to grab the mouth-watering economic opportunities presented by a country whose dramatic return from international isolation has gripped the imagination of the world. "From a hopeless failed state to an irresistible frontier jewel, the transformation is promising to be quite remarkable. A Billionaire sitting in London, Moscow, Shanghai or New York and scouring the planet for investment ideas cannot ignore Zimbabwe. 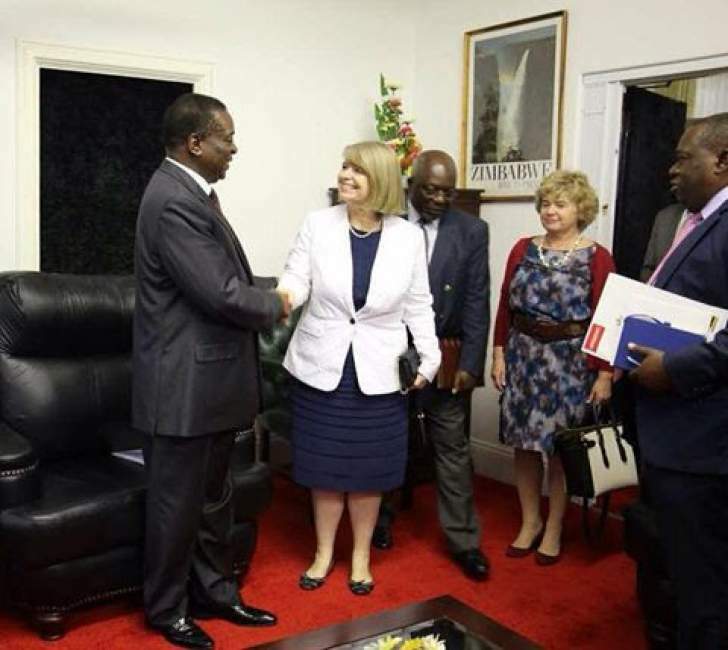 British Minister for Africa Harriet Baldwin arrived in Harare yesterday and had a meeting with the country's President. The Russian Foreign minister is on his way. Not to be left out, the United States Embassy in Harare who yesterday announced that "high-level" American visitors are headed for Zimbabwe," he said. "Taking the frenzy a gear up, the US Ambassador to Zimbabwe, Harry K Thomas Jr, is waxing lyrical, saying he adores this country so much that he wants to stay here after retirement. British Minister for Africa says she is excited and very happy with the government's stance and progress. Now listen, we dont want anyone to give us 15 Billion Dollars! We want to be able to attract investors and to be able to produce stuff worth 15 Billion Dollars by ourselves. We are capable! The investor must come and pay for our resources..we get the money..and the Zimbabwean child wants opportunities and a job. So, its a tri-partite venture." He said the foreign investor wants a share of our resources, we want some foreign currency, the Zimbabwean wants jobs and opportunities to thrive. "Mumwe nemumwe arikuda zvaa asina/Omunye lomuye ufuna angelakho. Then Munhu wese anobva afara handiti. That is all I want for my Zimbabwe and I am elated that we are getting there , bit by bit, brick by brick!. Trust me , this country is going to be great again. Not yet there but we are on track. Ongafuniyo akayekele/Asimgade ngaasare."